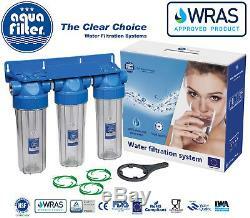 AQUAFILTER TRIPLE WATER FILTER HOUSING. Suitable for Biodiesel & Vegetable Oil Filtration. 3/4 BSP Brass Inlet Outlet. Antibacterial Filter Cartridge Centralizing Ring BACINIX. (with pressure relief valve and transparent sump). X3 Antibacterial Filter Cartridges Centralizing Ring BACINIX Technology. H10B series housings they are all dedicated for cold water on domestic and commercial applications. H10B series housings are compatible with broad range of 2 ½ x 10 type cartridges widely available on the market. H10B series housings consist of a transparent sump an head with brass 3/4 inlet/outlet inserts and two O-rings (one placed around sump thread and the other inside filter head). A transparent sump allows for the evaluation of cartridge contamination. Heads are equipped with a pressure relief valve (providing ability to release air pressure during cartridge replacement procedure). Utilization of two O-rings ensures maximum leak proof performance. NSF certified for structural integrity and material requirements. FDA CFR Title 21 Compliance. Two O-rings for maximum leak proof protection. Ideal for POE or POU use. Easy to connect to cold water inlet. Easy to install, no electricity, no drain required. Made in EU with high performance components. Clear housing (sump): polyethylene PET. Operating pressure: 6 bar (90 psi). Antibacterial Filter Cartridge Centralizing Ring BACINIX Technology. This product centralizes the filter cartridge inside its housing, reduces the risk of damage to the cartridge and housing elements at installation, and ensures seal tightness of the housing head all while protecting your filter from bacteria and other microorganisms, thanks to new nanosilver technology. Improves ease of cartridge installation. Increases ease of correct installation. Ensures proper vertical position of cartridge within housing. Stabilizes and centralizes cartridge for equal water distribution. BACINIX nanosilver technology, providing antibacterial and antimicrobial protection. Centralizes inhibit harmful growth of bacteria, fungi and molds by using nanosilver BACINIX technology. Reduces risk of dislodging cartridge. Protects cartridge from faults due to poor positioning. Facilitates consistently correct cartridge installation. Made in The EU with high quality materials. Goods ordered before 1pm will be sent out on the same day. The item "Aquafilter 10 Triple Water Filter Housing 3/4 + Bacinix Ring / Biodiesel" is in sale since Wednesday, August 03, 2016. 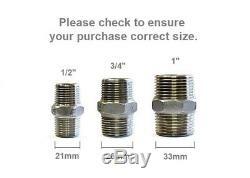 This item is in the category "Home, Furniture & DIY\DIY Materials\Plumbing".plus" and is located in Bridgwater. This item can be shipped to United Kingdom, Austria, Belgium, Bulgaria, Croatia, Cyprus, Czech republic, Denmark, Estonia, Finland, France, Germany, Greece, Hungary, Ireland, Italy, Latvia, Lithuania, Luxembourg, Malta, Netherlands, Poland, Portugal, Romania, Slovakia, Slovenia, Spain, Sweden, Australia, United States, Russian federation, Canada, Brazil, Japan, New Zealand, China, Israel, Hong Kong, Norway, Indonesia, Malaysia, Mexico, Singapore, South Korea, Switzerland, Taiwan, Thailand, Chile.